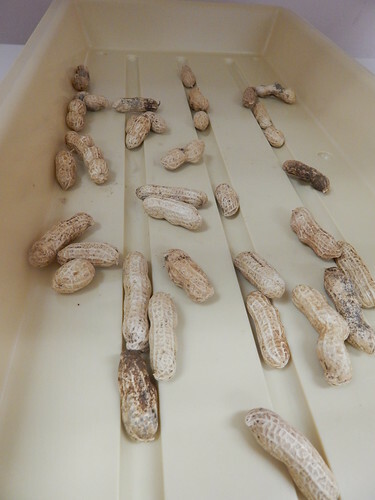 We harvested our peanuts a couple of weeks ago, even though we hadn’t yet had a freeze. The tops were definitely getting yellow and looking like they were almost done. I posted about it in one of the Friday PhotoEssays, but I thought I would pull that information out for you in a separate blog post. 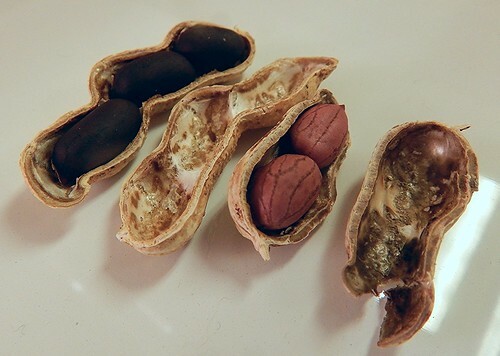 We grew two different varieties of peanuts, ‘Tennessee Red Valencia‘ and ‘Schronce’s Deep Black.’ We got these heirloom varieties from Southern Exposure Seed Exchange. In case you didn’t realize it, peanuts are a legume, just like beans and peas. 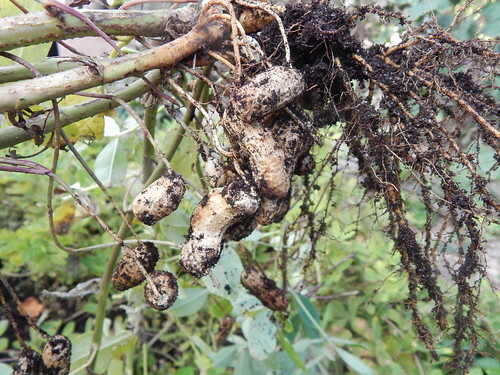 They also grow in pods below ground, but they aren’t tubers or roots like potatoes and carrots. One of the reasons that our yield this year wasn’t what we might have wished is that our heirloom peanut varieties were a lot taller and lankier than we had expected. This meant that when the flowers bloomed and produced the “pegs,” the pegs couldn’t reach the soil and produce peanuts. We could have had dozens more peanuts! So, the moral of the story is that we should either have chosen a modern variety with shorter plants where the flowers occur closer to the base OR we should have planted the heirloom varieties in a spot with more space to flop over and reach the soil. Another option would have been to hill them up, if we’d had space. Now we know! 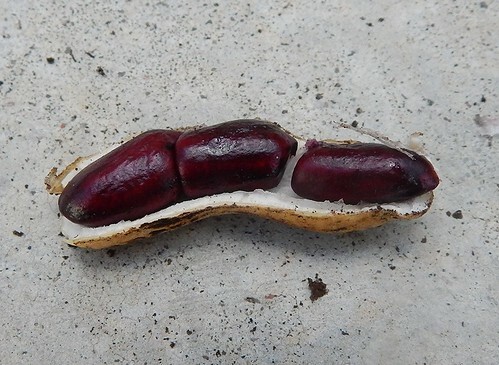 This is the ‘Schronce’s Deep Black’ peanut. 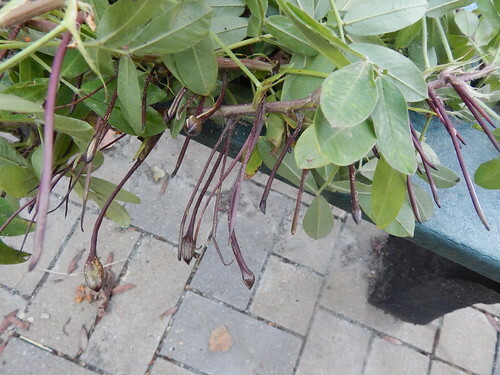 In the raw, undried form it has deep purple skins. This is the ‘Tennessee Red Valencia’ that is a more traditional color. Bright pink when raw that will darken to brick red when dry. As you can see, the colors have darkened quite a bit. The next step will be roasting…or boiling! What do you think? Roasted peanuts or boiled? 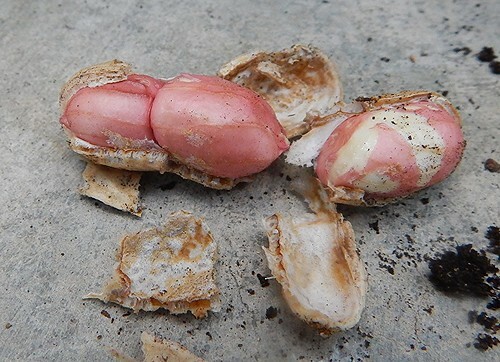 Posted on November 6, 2015, in Uncategorized and tagged harvest, peanuts. Bookmark the permalink. Leave a comment.